The world is steadily making its shift towards the digital environment. For booking tickets to ordering foods, everything is becoming online. So, if you have a business that is not online yet, you are missing out on a lot of potential customers. Where are those customers drifting to? Well, your fellow competitors! So, choose us and Grow Online Business to catapult it to success. Lagging behind your competitors is one of the circumstances that occur if you do not Grow Online Business. Moreover, if you have an online store, you reach out to your target customers very easily and that too in a short period of time. Also, your business is available 24*7 for your customers. So, it increases the bonding between you and your clients to a great extent. The e-commerce stores let you sell your products online and accept online payments as well. So, it is a brilliant strategy to drive online traffic to your website and Generate Sales. Finally, you get a higher ROI or Return on Investment due to this strategy. Isn’t this worth the money you will be spending for your online marketing? Work smart. Spend little but make sure you get the most out of it. Digital marketing provides you everything from promotions to websites to advertising your companies. So, you get every promotional technique just under one roof. With the traditional system of marketing, you had to spend for banners, ads and everything else separately. 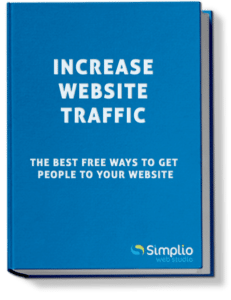 So, save money and Grow Online Business with Simplio Web Studio. The more you wait, the more opportunities to flourish you lose. So, choose Simplio Web Studio and Increase Traffic to propel your business growth.